In 2004 Klean Kanteen® released the first stainless steel bottle designed for personal use onto the market, the Klean Kanteen® Classic. It was simple in design and engineered for function in every way, built to change the way people drink and think. 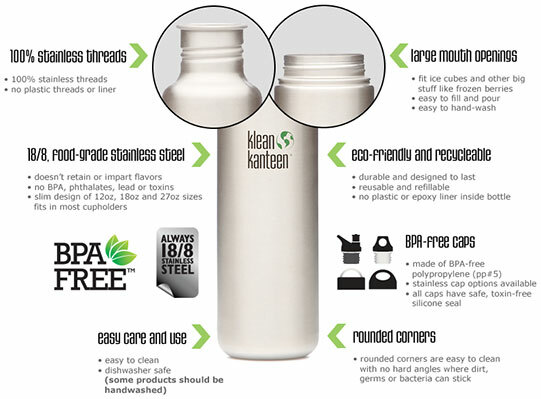 Klean Kanteen® exists because we wanted to give people a better option than plastic and lined aluminum bottles: a safe, healthy, lightweight, reusable bottle free of Bisphenol-A (BPA) and other harmful substances that’s easy to clean and keeps drinks fresh and delicious no matter how many times you refill it. Our community of Partners & friends. At Klean Kanteen®, we celebrate and promote companies, organizations, and individuals working to promote health, sustainability and environmental awareness. Our current Partners are The Breast Cancer Fund, Healthy Child Healthy World, CLIF Bar Green Notes and NatureBridge. We are also friends with a growing group of organizations and individuals worldwide who are working to make a difference. Klean Kanteen® is also a member of 1% For The Planet and donates a minimum of 1% of their gross annual sales to support the environmental conservation and education efforts of numerous nonprofit organizations. It's the healthiest, safest bottle you can buy. Our bottles have always been made from toxin-free materials, with large-mouth openings and rounded corners and threads so they're easy to clean. We also offer all-stainless cap options in all bottle styles. We don't greenwash. Klean Kanteen®'s really are eco-friendly. Klean Kanteens® are made to be refillable and reusable so you'll never need to buy water in a plastic bottle again. The bottle itself is also 100% recyclable, and in keeping with our commitment to environmental sustainability, Klean Kanteens® are manufactured responsibly in China at factories that are committed to strong environmental and fair labor standards. To build a reusable water bottle that changes the way people drink (and think), Klean Kanteen® had to create something vastly superior to aluminum and plastic bottles, especially the single-use kind.